The app itself is absolutely fantastic. 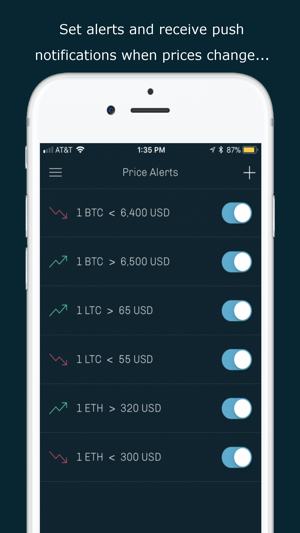 Clean interface, quick response time, and updated prices, which are significantly better than Blockfolio’s. 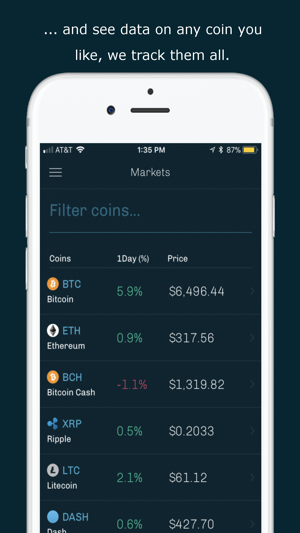 However, with this being said, it would be fantastic if a few more things were added such as the ability to see the market cap and 24 hour volume for each coin as well as fingerprint reader functionality to make it more convenient to access. Overall though, bravo developers. 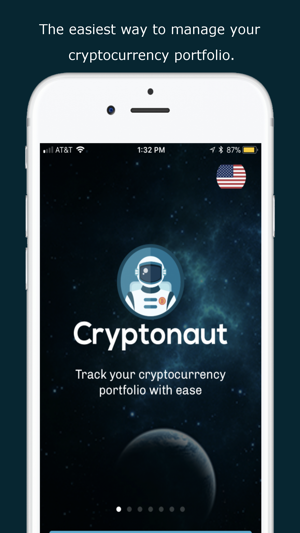 One of the better cryptocurrency tracking apps out there. Should be cloud-based so it can be accessed from multiple devices. What happens when a device stops working or replaced for a newer model. Can the data be transferred? Ethereum is not added to the dashboard histogram. It is added to the portfolio total, but not the graph. Sell something for ETH, such as LTC/ETH, and the graph plunges because the ethereum proceeds of the sale aren’t added to the graph. The reverse is true as well. I reported this on twitter and was told they would look into it, but not sure it went to the right place. 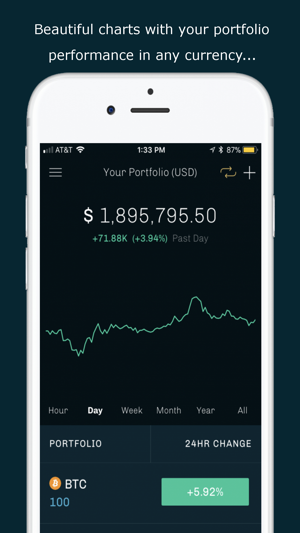 You will also be alerted that your portfolio went down or up by the value of a transaction into or out of ethereum so it’s not apparently confined to the graph. There should be a way to introduce starting balances for when you begin tracking a but don’t want to enter all past transactions. You should be able to delete simple transactions in case you entered a value wrong. I see that “apple didnt like it” but this was a VERY important feature for me. Not only would it allow me to keep my portfolio up to date across my devices but it allowed me to make a back up. So what now guys? What happens if my phone is lost or destroyed? I have a lot of info in here. Can you give the ability to set up an account that store my data? Is there really nothing that can be done? Otherwise it’s really a great app great design. My only other gripe is to set the exact time of your trade not just date.